Water Lettuce is a very popular floating aquatic plant. It is considered an annual in most areas of the country. It is a very inexpensive way to help achieve a happy balance in your Koi pond or water garden. Water lettuce has velvety foliage that spreads like strawberry plants across the surface; they may produce inconspicuous white flowers. The bright green leaves are deeply veined and resemble heads of floating lettuce; they grow to lengths of up to 10 inches and up to 4 inches wide. Water Lettuce helps to provide shade for the pond and fish, as well as a safe haven and spawning area for all pond fish. They help oxygenate and clarify the water and will use the extra organic nutrients in the pond, thereby helping with algae control for you fish pond. 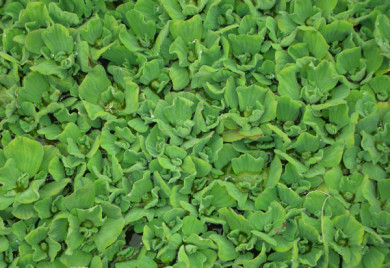 Water Lettuce seems to prefer some shade in warmer climates, but is also susceptible to frost, and even a brief exposure to frigid temperatures produces scalded leaves that quickly turn to rotting areas. Zones 9-11. Water lettuce is a free-floating plant with many spongy, dusty green simple leaves. The leaves are covered in very fine hairs and arranged in a spiral pattern from the center of the plant. The leaves are 1 to 6 inches wide and have large veins running their length. The flowers are seldom seen. Water lettuce is a very aggressive invader and can form thick floating mats. If these mats cover the entire surface of the pond they can cause oxygen depletions and can kill your pond fish like Koi or goldfish. . Water lettuce should be controlled so they do not cover the entire pond. A leader in Aquatic Plants For Sale – A Grower of Aquatic Plants for Ponds!